Home IELTS IELTS vs. TOEFL: Which Should You Take? Most English-speaking universities and immigration centers around the world require foreign students to take a standardized English test to judge whether they will be accepted into the university or country. The main exam for American universities is the TOEFL. But the main exam for the majority of British commonwealth countries is the IELTS. It sometimes gets a bit tricky for you to decide between these two options since in some cases you have a choice on which to take. In order to make the correct decision you have to take a lot of considerations into account. 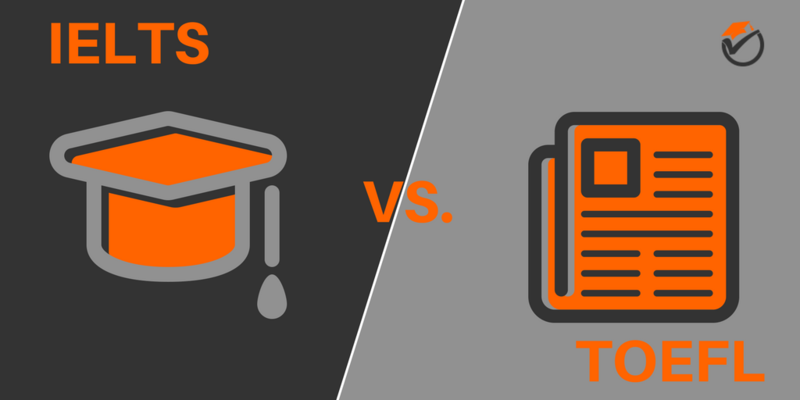 Below we give an IELTS vs. TOEFL comparison table and go over the differences and considerations you need to take into account while deciding between the 2 exams. More focus on international English accents and less focused on "inform" articles and multiple choice questions. Emphasis More focus on North American accents and more focused on "inform" articles and multiple choice questions. Reading, Listening, Writing and Speaking scores will each range between 1-9. Composite score is the average score of all sections (1-9). Scoring Reading, Listening, Writing and Speaking scores will each range between 1-30. Offered up to 48 times a year in test centers around the globe. Offered When? Offered up to 50 times a year in test centers around the globe. There are many distinctions between the IELTS and TOEFL tests. We will point out these differences in the sections below. One main difference between the 2 exams is that the IELTS is spoken in many different English accents, while the TOEFL is spoken in just an American accent. This makes sense since the IELTS is mostly taken for schooling in British commonwealth countries while the IELTS is usually taken for admission to schools in America. Another dissimilarity between the 2 exams in that the IELTS is significantly shorter in length than the TOEFL. In almost every section the IELTS is only about 2/3rds of the length of the TOEFL. The TOEFL is about 4 hours long while the IELTS is about 2.5 hours, a large difference. Another major difference is that the TOEFL can only be taken on the computer, while the IELTS is normally taken as a hand-written test. Testing facilities will provide you with a computer and keyboard for the TOEFL, but for the IELTS you will be afforded a pencil and paper. Also, another key difference between the 2 exams is that the TOEFL is primarily a multiple-choice exam, while the IELTS asks many different types of questions. On the IELTS, you can be asked fill in the back, multiple choice, matching or many other different question types. The TOEFL exam is much, much more popular than the IELTS. Around the world, it is taken over 10 times as much as the IELTS. Because of this there are many more testing locations and centers that offer the TOEFL. This means that there is more likely to be a testing location near where you live, making it a lot easier to take the exam. Since the TOEFL and IELTS can be taken all over the world, it is very difficult to compare the costs of both tests. Both exams change the amount that they charge for the test from region to region, sometimes the TOEFL is cheaper, while sometimes the IELTS is most budget friendly. The 2 exams also differ from each other in respects to how they structure the reading section of the test. The TOEFL only asks multiple choice type questions. This makes it easy to guess if you do not know the correct answer since you can just randomly guess and get the correct response. On the IELTS they have many different question types like fill in the blank and matching which can make it harder for some test takers. The 2 tests are similar in the types of passages that are on the exam. They both include passages that are academic in nature that include articles from academic journals, newspapers and other academic sources. The 2 exams are also different in how they approach the reading difficulty of the passages. On the IELTS the passages start off easy, but then get more difficult as you get deeper into the exam. While the TOEFL keeps the passage difficulty around the same level for the entirety of the reading section. The 2 tests are also very different in their listening sections. The biggest difference is the fact that the TOEFL is based mostly on an American accent, while the IELTS has more international English accents. This makes sense since the TOEFL is the primary test in America. The TOEFL listening passages also include “filler words” like um and er which make the speaking sound more authentic and realistic. In the IELTS no filler words are spoken and the speakers sound like they are reading from a sheet of paper rather than having a conversation. Also in the TOEFL, all of the conversations normally revolve around university life, so it is a lot easier to infer what is being said from this context. In the IELTS, the conversations can be from any different type of setting or context, so conferring meaning can be a lot harder. The differences between the 2 tests on the writing section are similar to those that you will encounter on the other sections of the exam. Since the TOEFL is a computer based test and the IELTS is not, your writing responses will be typed into the computer and not hand written, like on the IELTS. This means that you will need to have a certain level of computer literacy to not give yourself a disadvantage on the exam. Slow typing will give you less time to come up with your response. The prompts on both exams are somewhat similar, but the IELTS is the only on that requires the test taker to summarize data from charts and diagrams for a prompt. Other than this difference, the writing prompts on both exams are similar. The 2 exams also are very different in regards to how they administer the speaking portions of their exams. Since the IELTS does not use a computer, you speak face to face with an exam proctor. This is the only person that will grade your speaking portion of the exam. On the TOEFL, the speaking section of the exam is administered through the microphone on your computer. Up to 6 proctors will grade your speaking audio to decide a grade. The difference above is the main difference between the 2 tests’ speaking portions. The questions that you will face on the speaking section of each exam are pretty similar. IELTS vs. TOEFL: Which Is Right For You? Why are you taking the exam? Most universities and governing immigration bodies only accept one of these exams. Make sure that you check with where you are applying to make sure that you actually have a choice on which test to take. In most cases, the TOEFL is accepted by most universities in the United States while the IELTS is accepted by British commonwealth countries. Also, the TOEFL is specifically used for academic enrollment while the IELTS can be used to immigration purposes, also. What English accent are you most used to? The accent that you are used to conversing in also should play a big part in your decision. Since the IELTS is mostly accepted in British commonwealth countries, the accents the test uses are from all over the world. The TOEFL, mostly used for American universities, uses an American accent for its dialogue passages. Make sure to choose the test with the accents that you are most comfortable with. Can you sit and concentrate for a long test? How long you can keep your concentration up will also play a big part on making your decision. The TOEFL is taken over a half of a day, over 4 hours. The IELTS is more than an hour shorter! This can make a big difference to some test takers that cannot concentrate for that long of a period. Exams like the IELTS and the TOEFL can be very draining because they cover such a broad range of skills, using both sides of the brain. Make sure to choose the exam that best suits your focus and concentration abilities. Are you comfortable with using a computer to take the exam? Your skills with a computer can also play a big role in deciding which exam to take. The TOEFL is only offered in a computer based format, while the IELTS is usually offered in a pencil and paper format. All of the portions of the TOEFL are computer based; so, you will need to know how to use a keyboard and be comfortable talking into a microphone. Being a slow typist can really set you back on the TOEFL since the writing portion is timed. If you are slow, you may have less time to outline and come up with your response before typing it. Are you looking for a list of the best prep books for either the IELTS or the TOEFL?